On a THS(typical house shot), the oil is applied significantly less towards the outer portion of the lane and drastically increased on the inner portion of the lane. On a THS, you can always migrate towards the inner portion of the lane to find more skid. This increased skid allows for the ball to float easier down the lane into the drier boards to the outside and in the back end of the lane. This is NOT the case in many challenging or sport compliant patterns, the oil is placed more evenly upon the lane. This puts a great demand on accuracy and speed repetition also known as shot making. As you bowl on these challenging patterns, the lane is far less forgiving and more importantly far less of a static environment. The lane is ever changing, every ball that goes down the lane alters the playing field. As more and more balls travel down the lane, they will absorb oil from the first 1/3 of the lane (the heads) at a far faster rate than they do the rest of the lane. Why is this? There is MORE oil placed in the heads. Wherever there is the most oil, more will be absorbed by today's bowling balls. The more oil that is used, the less static that environment becomes due to ball traffic. You can change to a less aggressive ball and keep your trajectory angles a bit tighter. You can move farther to the inside portion of the lane, with the same ball, and use more of an open angle, and LOWER ball speed to go around those trouble spots that you are encountering. This is by far the most difficult, but also most effective- Bowlers who have naturally more axis rotation and reduced axis tilt, are not as susceptible to this particular lane play issue. Imagine a bowler like, Pete Weber, who has a very high amount of axis rotation with a very low axis tilt. The reason why increased rotation and lower tilt works when the heads start to go away and the oil down-lane has not is track circumference. The more of your ball that comes in contact with the lane bed before it makes a complete rotation, the less sensitive it is to oil/dry differences. The ball has a truer roll to it. It might seem counter-intuitive to think that a ball that rolls heavier would not hook as early on a dry lane as a ball that spins, but it is a fact. A ball that spins(increased tilt and reduced rotation) loses its energy far faster than the heavier rolling ball. Spin burns off at a drastically increased rate than how roll burns off. So next time you are encountering these issues, take a look around at which bowler is succeeding. WATCH their ball roll down the lane, not their particular style, just the ball itself. There is a lot to be learned if you allow yourself to learn it! If you are heading to Syracuse for the OC’s this year, then you’ve probably already started thinking about what equipment you are toting along. And since ball slots are limited and checked bag fees are high, the gravity in your selection process becomes pretty critical. As with any arsenal, variety is key. Sounds easy, right? Obviously, there’s a lot that goes into it that can become a daunting task for even the most seasoned professional. The boundless options that are available on the market should be used to your advantage, but it all starts with the bowler. Knowing the subtle distinctions in how you roll the ball, such as axis tilt, axis rotation, speed, and rev rate, are most crucial. Once you’ve determined your stats, next comes the ball selection process. As always, variety is key. The Open Championships have now abstained from announcing the oil pattern prior to the tournament commencing – which is perfectly fine. You can bet on it not being a cakewalk. Balls that exude control and forgiveness are going to be your best friends with any trip to the OC’s. What kind of balls do this? Well, your favorite benchmark should be the first thing that comes to mind. A low RG, solid, matte finish ball that is smooth and brings the breakpoint closer to the foul line would definitely provide this for the bowler. The !Q Tour is the second longest running ball in Storm’s history for this very reason. After that, building an arsenal is pretty straightforward. Having a good mix of solids, pearls, hybrids with a combination of surfaces and layouts is important. Typically, you won’t see too many polished balls going down the lanes at the Open Championships. The reason for this all boils down to controlling the breakpoint. 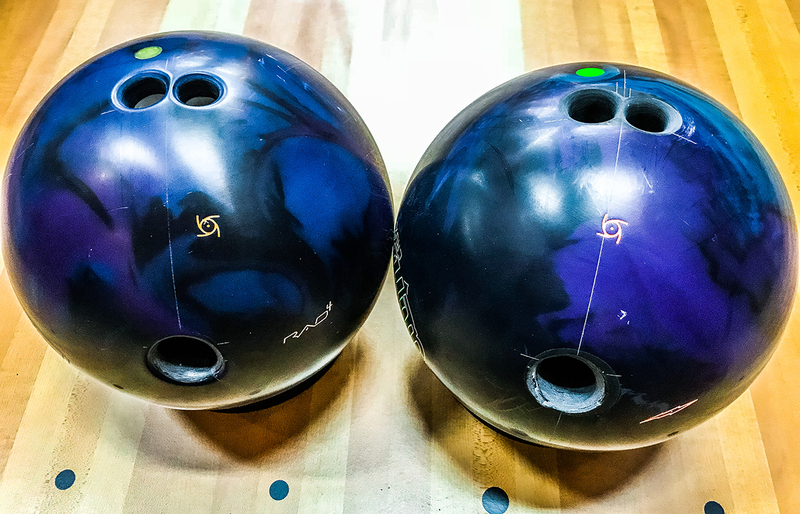 Sanded balls maximize your room for error by picking up on the midlane better than polished balls and bringing the breakpoint - the most critical part of the lane - closer to you. It’s not a mystery anymore that surface is the #1 most influential factor that dictates ball motion. The bowlers that perform the best every year will almost always bring a wide array of 500-grit to 4000-grit sanded balls. I’m not saying omit polish completely, so reserve one to two spots in your bag for when they get “toasty” later in the day. Layouts are the last big thing to discuss. Working with your Storm VIP pro shop professional to establish which layouts are best for your style and the arsenal you’ve chosen is imperative. 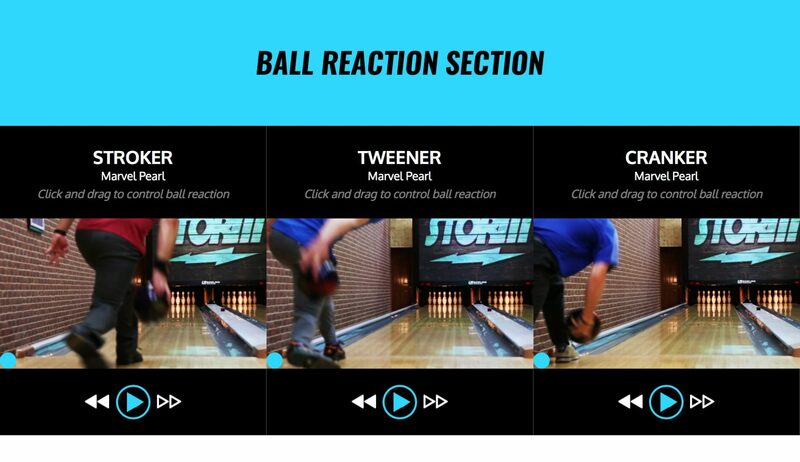 Some of the most accomplished bowlers will use around three of their favorite layouts and let the inherent properties of the balls be the major difference in what they see. Pete Weber, for example, has only used two layouts for years: one pin up above the bridge and one pin down below the bridge. There are enough factors in bowling that are above and beyond anyone’s control, and, no matter how hard you try, you cannot change them. So keeping the variables in check that you can control, like Pete, isn’t such a bad idea after all. Below is a sample 6-ball arsenal that would cover all of your bases at the Open Championships this year. Keep this list close as you prepare for your next tournament. Make sure your equipment is ready. Inserts are fresh, thumb holes feel good, interchangeable thumbs are operating properly, and that you a backup interchangeable thumb for any emergencies. An accessory bag filled with grip adjusting products. Some things to include are: thumb insert tape, thumb/finger protection tapes, tape knife/tape tool, scissors, fingernail clippers. Abralon pads/surface adjusting products are a must for fine tuning ball reaction. These jewels are a tournament bowlers friend. Shoes. If you do not have high performance shoes with removable heels and soles, get some. Every bowling center is different and proper footing is essential. Get yourself many combinations of heels and soles. Fine tuning here is paramount. Add a shoe brush for those slick approaches to your accessory bags. Rosin and/or hand conditioner can come in handy too. Shoe covers to protect your shoes for trips out of the settee. Some anti-inflammatory medication as you never know when those little beauties will be needed. Storm Shammy to wipe your ball off, do this every shot! If it is an event that requires proper attire, your bowling clothes! I have forgot my “name” shirt on more than one occasion in my career, it can be quite the embarrassment. Storm apparel works very well in this situation! The most important thing is to bring an open mind and a willingness to learn. Every time we step onto the lanes there are lessons to be learned, but only when our mind is right. What is your velocity, rev rate, axis tilt, and axis rotation? What is the volume and length of this oil pattern? What three key points are you looking to play? Question 1 helps you choose the proper layout for his/her game. Higher ball speeds, lower rev rates, and more side roll require layouts that react earlier or sooner. This can be achieved with layouts such as the 4x3x1 and 3x4x2. On the converse, it is best to select more stable, lower flaring drillings for players with slow ball speed, high rev rates, and/or more forward roll. You might consider a 5x6x4 or 6x5x5. 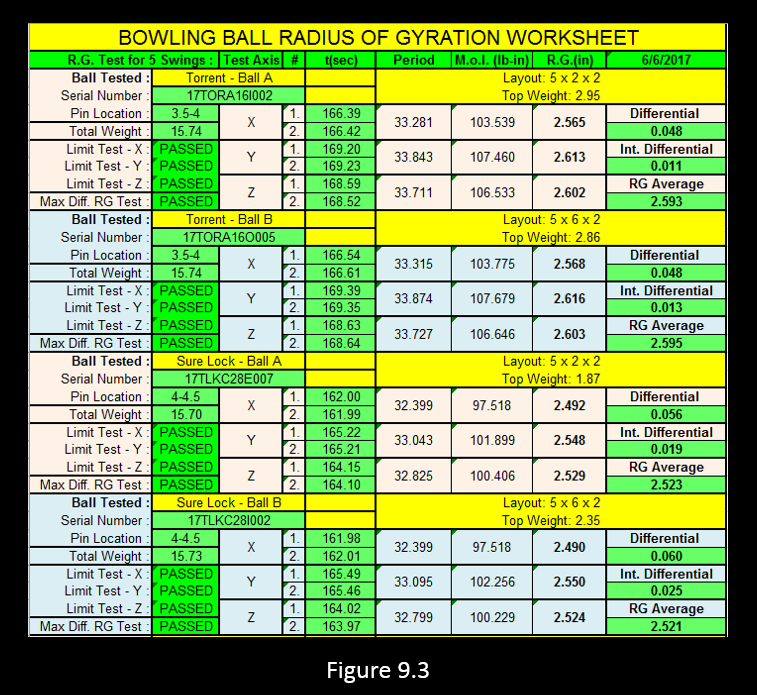 Question 2, regarding the oil pattern, will help you select the appropriate bowling ball. The Storm website has so much valuable information which will help you understand the intent of each ball we release. Under each ball page you will find videos showing ball motion for each particular ball for three drastically different styles. Plus, know that the most dynamic balls are found in the Premier Line™ while the rest of the lines feature a variety of core and weight block concepts designed to help you find the perfect ball for your game and condition. And finally, regarding the three key points, the third question will help you dial it all in. A down-and-in trajectory on a lighter oil pattern will require a smoother surface than one which goes away from the pocket and crosses several boards. Choose a duller surface on a ball that flares more when looking to ‘belly’ the ball a lot. If your player is trying to take the more conservative route, have him/her choose a ball with low flare characteristics. It’s all about ‘matching up’! We will all score better when we have a true ‘arsenal’ of equipment with a variety of coverstocks and cores or weight blocks. Once this is achieved, the next step is selecting the right ball, or succession of balls, for each situation. Versatility is mandatory to succeed in today’s ever-changing environment. 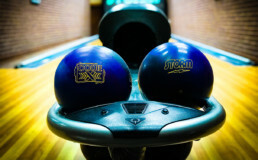 To learn more about Storm’s line of high performance equipment, spend some time on our website, exploring all the different sections here at http://www.stormbowling.com, or feel free to contact me via e-mail at stevek@stormbowling.com. 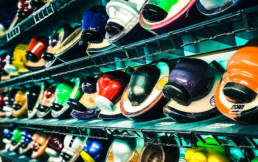 There are many decisions that need to be made after purchasing your newest bowling ball. All of them are pieces of a puzzle that fit together properly to create good ball motion. The Pin-to-PAP distance is going to be the first and one of the most important decisions that should be made regarding the layout. Of the changes you can make to a layout, Pin-to-PAP distance is going to have the greatest effect. If you are starting to build a new arsenal, it is best to take a look at some of your current equipment to see what types of Pin-to-PAP distances you have been utilizing. You may notice you prefer certain distances over others. You might find that all of your equipment utilizes a similar distance. Does that distance match up well to your ball speed/rev rate or the conditions you are bowling on? Pin-to-PAP distance might happen to be the piece of the puzzle that was missing for you. After reading this article, you may begin to understand why you struggle on certain conditions. The goal of this article is to open your eyes to experimenting with different Pin-to-PAP distances to create different shapes. Let’s take a look at some background information on what the Pin-to-PAP distance is and how it affects ball reaction. The Pin-to-PAP distance (appropriately enough) is the distance from your positive axis point to the pin. It is going to control how much of the core's flare potential you utilize in the bowling ball. It is controlling how the core is oriented at the moment of release. 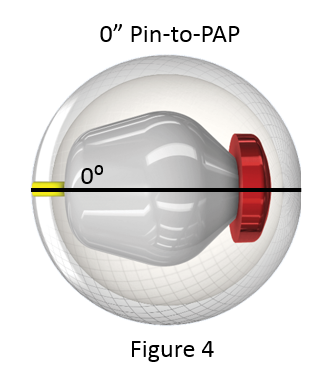 The Pin-to-PAP distance can range anywhere from 0 to 6 ¾". You might notice that this is approximately 1/4 of the bowling ball. We have turned the coverstock and core translucent in the above figures to show you the orientation of the weight block with different Pin-to-PAP distances. It's important to note that these do not take into consideration axis rotation or axis tilt. They are simply rolling forward with 0 degrees of both axis rotation and axis tilt. Figure 1.1 shows the position of the core at release with a 0" Pin-to-PAP distance. We've put a green dot on the weight block to aid in visualizing the rotation since there is minimal movement. This illustrates how stable the weight block is upon release and why it doesn't create a significant amount of track flare. It is rotating around the lowest RG axis. Skip over to Figure 1.3. Once again the weight block is in an extremely stable position. It is standing completely up rotating around the highest RG axis. Figure 1.2 illustrates the rotation of the weight block exactly halfway between these two points at 3 ⅜". The weight block will be in the most unstable position because it is sitting at a 45-degree angle inside the ball at the release point. This is going to result in the highest amount of track flare that particular core can produce. 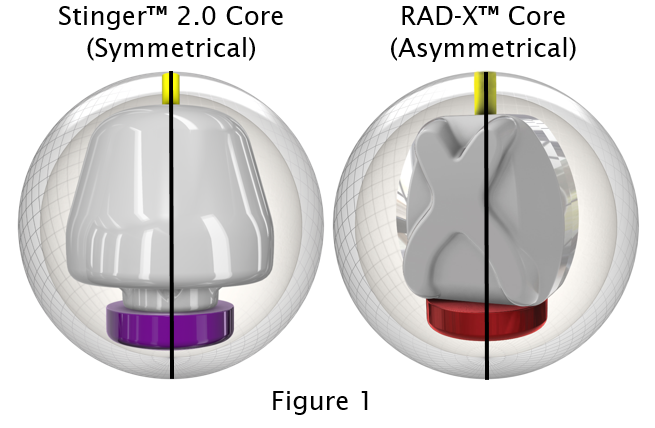 Different cores are going to produce different amounts of flare depending on the amount of total differential in the shape of the weight block inside of the core. Simple shapes can produce as little as 1" of flare. 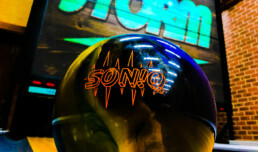 More complex shapes can produce upwards of 6" of total flare on the bowling ball. 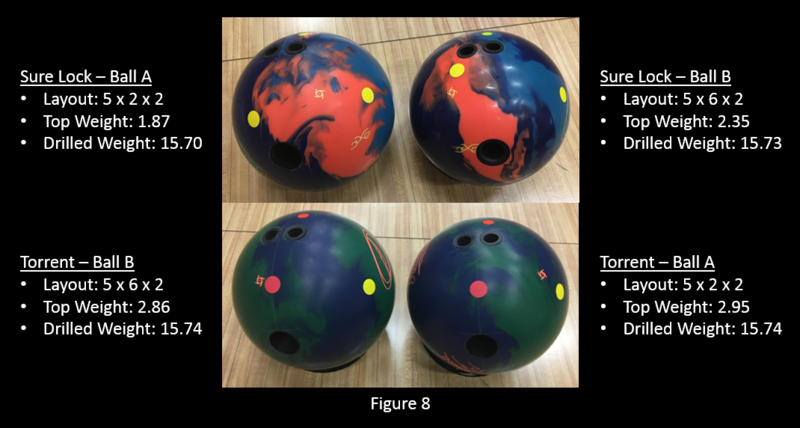 Now that we know the flare potential of the bowling ball can be manipulated using different Pin-to-PAP distances, we need to see what happens on both sides of the RG curve to understand why a ball can flare the exact same amount, but give us two completely different shapes down the lane. Figure 2 shows the general position of the core with a strong Pin-to-PAP distance. You can see that a Pin-to-PAP distance of 3 ⅜" utilizes 100% of the core’s flare potential because it is sitting in the most unstable position at the point of release. This is going to cause the core to wobble more than any other position which produces the most track flare. Stronger Pin-to-PAP distances are going to give you a strong predictable motion that you can count on in the midlane. This can be good in many different situations. One that comes to my mind is when the lanes are transitioning and you need something to blend out the pattern. 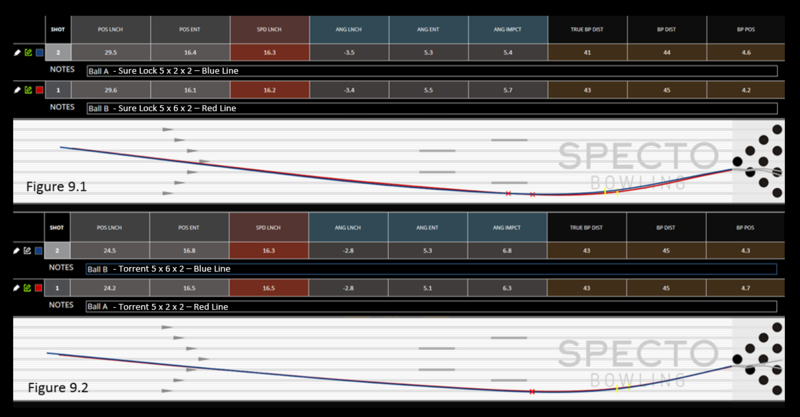 Depending on the lane surface and volume of the oil pattern, you can even get away with these stronger Pin-to-PAP distances on some shorter patterns because it revs up strong in the midlane and blends out the end of the pattern. If we move up the curve, we increase the distance from 3 ⅜" towards 6 ¾" we utilize the higher RG side of the curve. 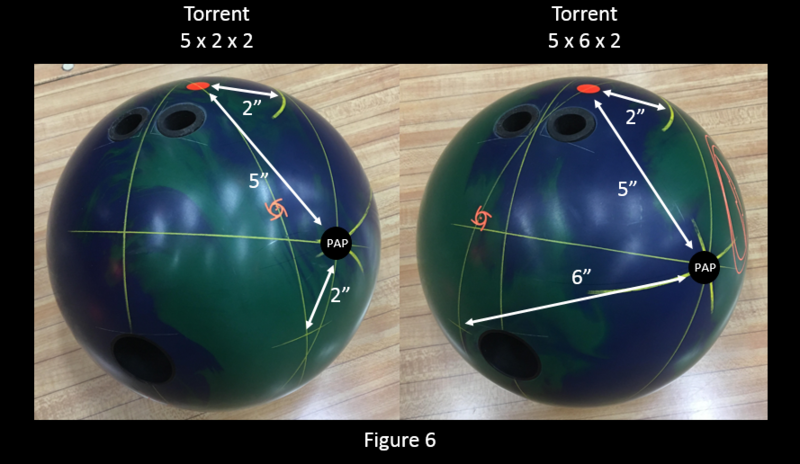 As we get closer and closer to 6 ¾", the flare potential in the bowling ball is lowered because we are putting the core in a more stable position. This results in the ball hooking less and later down the lane. This happens because we are standing the core up in a more stable position about the higher RG axis. The higher the RG, the more resistant the ball will be to changing direction as it travels down the lane. Using longer Pin-to-PAP distances is going to raise the RG and promote a slower transition with a cleaner shape through the front part of the lane. You will see more change in direction down lane with longer Pin-to-PAP distances. Figure 3 shows the general position of the core with longer Pin-to-PAP distances. In general, longer Pin-to-PAP distances are good to use on the burn when you need the extra tumble through the front part of the lane. The ball is going to want to conserve energy much longer and transition slower. As soon as the bowler releases the ball, the energy the bowler imparts on the ball will begin to be lost. Controlling how quickly the energy is lost is crucial to creating good ball motion. There are more variables than just the Pin-to-PAP distance that influence the rate that energy is lost, but for this article's purpose we are simply looking at this one piece of the puzzle. Using too strong of a Pin-to-PAP distance when the pattern is extremely dry will result in the ball losing too much energy too early on the lane. It is going to be very difficult for the ball to get through the pins properly when it has used up a majority of its energy in the front part of the lane. We only have 15lbs of ball to knock down 34lbs of pins. We need the ball to be in the proper phase of ball motion at the correct entry angle to win the battle. To accomplish this, you'll want to make sure you are using longer Pin-to-PAP distances when the lanes are drier to promote a cleaner look through the front with more energy down lane. This will allow the ball still have enough energy to make it around the corner and get through the pins properly. Keep in mind there are always exceptions in our game, but this gives a good generalization to get your mind headed the right direction. 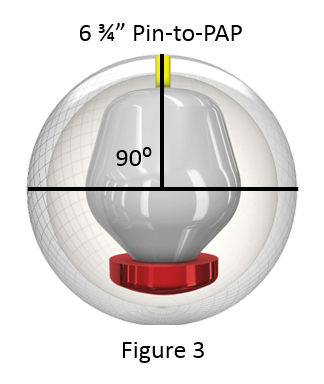 Figure 4 shows the general position of the core with shorter Pin-to-PAP distances. The more we begin to decrease the distance from 3 ⅜" towards 0" we utilize the lower RG side of the curve. As we get closer and closer to 0", the flare potential in the bowling ball is lowered because we are putting the core in a more stable position. This will result in the ball hooking less and earlier on the lane. This happens because we are lying the core down in a more stable position about the lower RG axis. The lower the RG, the less resistant the ball will be to changing direction as it travels down the lane. Using shorter Pin-to-PAP distances is going to promote a faster and smoother transition through the front part of the lane. You will see a much earlier roll with not much direction change down the lane if you utilize shorter Pin-to-PAP distances. In general, this would be good to use on either the fresh, or a very short pattern where you are looking for control off the end of the pattern. The ball is going to get into a roll extremely early because the core is laying in such a stable position around the lowest RG axis. This means that it will use a lot of its energy early and smooth out the reaction down lane. This can be great when the lanes are really flat and you are looking to stay out of trouble. You will get a smooth predictable reaction out of shorter Pin-to-PAP distances. Of course, it could be a bit of a challenge to get them to go through the pins properly because so much of the energy is used in the front part of the lane. Remember, we have a 15lb ball against 34lbs of pins. Luckily modern day bowling balls cause lane patterns to transition extremely fast. The bowler should be able to move from these shorter Pin-to-PAP layouts to other layouts that will give them more shape down lane. Shorter Pin-to-PAP distance layouts definitely aren't what you want to have on every ball, but they can save you from the dreaded 150 game on the fresh or when the pattern is extremely difficult. That could be the difference between winning and losing. It's not always the ball that you throw in the finals that got you the win. Sometimes the unsung hero is the ball that keeps you out of trouble when the lanes are tough. A good arsenal is always going to have at least one shorter Pin-to-PAP distance ball for control. 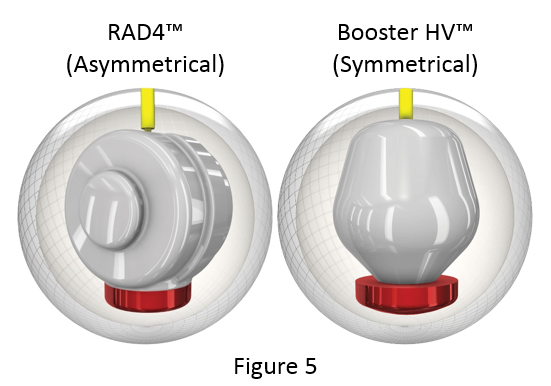 One final topic that must be addressed when discussing Pin-to-PAP distance is the different effects it has on a symmetrical ball verses an asymmetrical ball. Figure 5 shows the difference between a symmetrical shape and an asymmetrical shape. Since an asymmetrical ball has the presence of a preferred spin axis (PSA) there can be significant differences when using longer Pin-to-PAP distances. These differences depend on the location of the PSA. 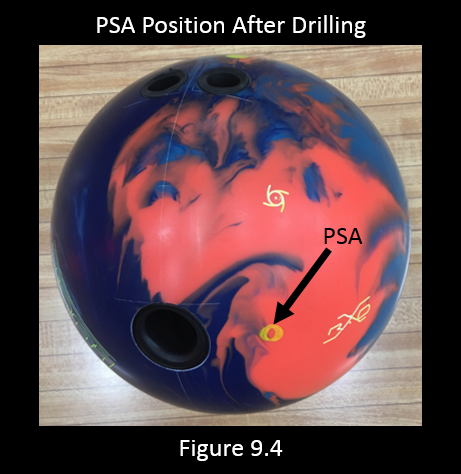 If the ball driller puts the PSA in a weak position, longer Pin-to-PAP distances will react similar to a symmetrical ball. 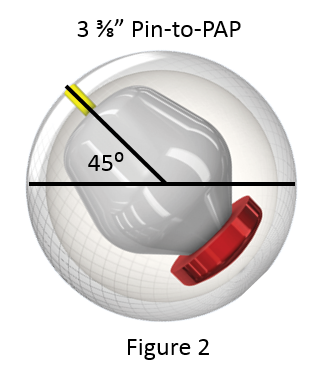 If the PSA is placed in a strong position, the ball will actually flare more with longer Pin-to-PAP distances than they will on a symmetrical ball. This is just another example of how much more versatile some of those asymmetrical shapes are. They can be fine-tuned further than a symmetrical ball to get a closer match to what you are looking for. Concluding this article, we can see that the Pin-to-PAP distance is a powerful tool in creating proper ball motion. It controls how much flare and what side of the RG curve we use. A problem many bowlers have when they run into issues with carry is their ball either still hooking or being completely rolled out at the pins. There is a small window in there where the ball is in a strong roll. A ball is always going to transfer more energy if it is rolling through the pins. We are bound by the laws of physics in our world. We have 34lbs of pins is standing in the way of a 15lb bowling ball. The pins are always going to win unless we get the ball into the roll phase at the correct time and at the proper entry angle. Pin-to-PAP distance is going to help you control how much energy your ball has and where it begins to use it so you can begin to create the proper shape and entry angle. Always be sure to have a few different Pin-to-PAP distances in your arsenal to be sure that you can create the right amount of flare for anything you are bowling on. As previously stated, there are many more variables that influence ball motion. This article looked solely at Pin-to-PAP distance and held other variables constant. This is just one piece of the puzzle to creating good ball motion. Future articles will cover other pieces of the puzzle to help you understand the entire picture.